Download "Michigan Youth Flag Football Drills: Overview"
1 Michigan Youth Flag Football Drills: Overview Drill #1: Warm-Up Drill: "Jingle-Jangle" This is a good way to begin practice. After a short stretching period this drill gets players loose and warmed up, while also helping them practice their agility and footwork. Drill #2: Centre QB Exchange Purpose: To develop proper snapping technique. This is a relay race. The quarterback and centre on each team start the race. Drill #3: Passing Drill: Progressive QB This drill helps refine and improve passing technique by concentrating on proper arm and hand movement. Drill #4: Passing Purpose: To develop proper passing technique. Participants pass the football back and forth to their partner. Drill #5: Individual Pass Patterns Learn about the Yard Curl, Yard Out, Yard Post, Post Corner, Streak and the Yard Smash Drill #6: Passing and Receiving: Run & Shoot This drill helps players understand simple passing routes, from the perspective of both quarterback and receiver. Drill #7: Passing & Receiving Purpose: To develop running, passing, and receiving skills. This is a relay race. The object is for QB 1 to pass to WR 1, who has run to cone (A) to catch the ball. Drill #8: Passing & Receiving Purpose: For a WR to find an open area in order to catch a pass. The object is for the QB's to pass the football around until an opportunity arises to throw the football to the WR. Drill #9: Passing & Receiving Purpose: To develop proper pass patterns and defensive skills. The WR snaps the football to the QB and the WR runs a 5-yard "out" pattern. The cones are set out to indicate direction. Drill #10: Passing & Receiving Purpose: To develop proper receiving and passing skills. Teach participants how to spread out and use the entire field. 2 Michigan Youth Flag Football Drills: Overview Continued Drill #11: Pass Pattern Combinations Learn about the Streak Out, Streak Curl, Post Out, Corner Smash, Curl Post Corner and the Twin Curl. Drill #12: Tosses Purpose: To develop proper tosses or pitches. Set out a 20 x 20-yard area. Divide teams into even groups and place players opposite each other across the line about 5 yards apart. Drill #13: Running with the Ball Purpose: To develop running skills. This is a relay race between teams. The first participant in each line has a football and will run with the football around each cone and then come back to the beginning of his/her line. Drill #14: Running with the Ball Purpose: To develop running skills and avoid having the flag pulled. Relay race between teams. Drill is completed when all RBs have run through the mini end zone once. Drill #15: Running with the Ball Purpose: To develop running skills and avoid having the flag pulled. Pair players up one as a RB and one as a DB. The DB is in back of the RB and chasing the RB from behind. Drill #16: Defense Purpose: To develop defensive back skills. The object is for the RB to run along the line of scrimmage and select an area between the cones to run through. Drill #17: Defense Purpose: To develop running skills and avoid the DB. Also teaches RBs to run to an open area. The object is for the RBs to run past the DBs to the opposite end zone without getting their flags pulled. Drill #18: Defense Purpose: To develop the defensive skills of pulling the flag and following a WR. This is a mirror drill. Players must "mirror" and stay with the player lined up across from them. Drill #19: Defense Purpose: To develop defensive skills of backpedaling and pulling the flag. Pair up kids one group is WRs, the other DBs. Each DB will backpedal and "mirror" the WR. All players will start in slow motion on the instructor's command. Drill #20: NFL Ultimate Purpose: To develop awareness and feel for the flag football concept. The concept is for the team with the football to pass the ball to teammates without dropping the ball, all the while moving the ball toward the end zone. 3 Michigan Youth Flag Football Drill #1: Warm-Up Drill: "Jingle-Jangle" This is a good way to begin practice. After a short stretching period, this drill gets players loose and warmed up, while also helping them practice their agility and footwork. Developmental Goals: Improve balance, footwork, and change of direction. Place cones at corners of 15-yard square. Line up players at one corner of square. Players then: 1. Sprint to first cone 2. Side-step to second cone 3. Backpedal to third cone 4. Sprint back to beginning of line. Throw a football to each player as he or she finishes the drill. Repeat drill to other side after everyone has had a turn. 4 Michigan Youth Flag Football Drill #2: Centre QB Exchange Developmental Goals: To develop proper snapping technique. Set Up: Set out a 20 x 20-yard area. Divide teams into even groups and place in even lines. Place cones in middle of drill four yards apart. One football per team; the entire class can participate. This is a relay race. The quarterback (A) and centre (B) on each team start the race. The centre (B) snaps directly to the QB (A). The centre will stand still while the QB runs to the next cone. The previous (A) snaps to (B), then (B) snaps to (A) and so on, until course is completed. The race is continued until each participant gets a turn. Progression: Shotgun snap. Center must place the ball on the ground before snapping. 5 Michigan Youth Flag Football Drill #3: Passing Drill: Progressive QB This drill helps refine and improve passing technique by concentrating on proper arm and hand movement. Developmental Goals: Perfect throwing motion while using only the throwing arm. Set Up: Pair off participants into two parallel lines. Players start on both knees, throwing to their partners five yards away. Show players how to follow through with their arm, so that their thumbs end up pointing down. Have each player begin with football held above his or her waist. Demonstrate how to throw from no higher than their ear. Progressions: After several throws, have players switch to kneeling on right knee. Then after several throws that way, have them switch to left knee. Next, have them throw standing up with feet together. Finally, have them practice a three-step drop, then a five-step drop before throwing. 6 Michigan Youth Flag Football Drill #4: Passing Developmental Goals: To develop proper passing technique. Set Up: Set out a 20 x 20-yard area. Divide teams into even groups and place players opposite from each other about 3 yards apart. The entire class can participate if there are enough footballs. With a limited amount of footballs, place students behind each other and have them wait for a turn or pass the footballs available in a zig-zag pattern. (Shown above.) Participants pass the football back and forth to their partner. Progression: Begin with the participants on both knees facing each other. Kids throwing from their knees will focus on the throwing motion without the use of their legs. Progress to right knee up and then switch to left knee up. 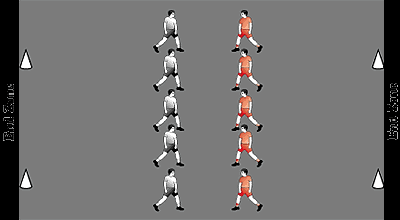 Next, have players stand straight up and pass with feet apart. Passing motion is the same as throwing a baseball, javelin, or handball. The hand without the football points to the target or the receiver. Make sure kids follow through on their throws. Point - step - throw. The receiver forms a target with both hands, palms facing out with thumbs and pointing fingers touching. The receiver's fingers should form a triangle. 7 Michigan Youth Flag Football Drill #5: Individual Pass Patterns 5 Yard Curl: The WR runs up the field 5 yards, stops, and returns back towards the QB. 5 Yard Out: The WR runs up the field 5 yards and cuts to the sideline. 8 Yard Post: A WR runs up field 8 yards and cuts toward the centre of the field on a 45- degree angle Streak: The WR runs straight up the field as fast as possible. Post Corner: The WR runs up the field. At 8 yards he cuts toward the centre of the field and after 2 yards runs towards the corner of the end zone. 5 Yard Smash: The WR runs up the field 5 yards and then turns toward the QB and side shuffles with body facing the QB. 8 Michigan Youth Flag Football Drill #6: Passing and Receiving: Run & Shoot This drill helps players understand simple passing routes, from the perspective of both quarterback and receiver. Development Goals: Passers: Accuracy and how to lead receivers Receivers: How to run pass routes Defensive Backs: How to watch receivers and cut to the ball. Set Up: Divide your team into three groups. The first player in line is the first passer; the second goes out to play defensive back; the third is the receiver. The outside groups run simple 10-yard square-out patterns, while the middle group runs 10-yard turn-ins or buttonhooks. Rotate each line this way: After passing, the quarterback becomes the next receiver; the next player in line becomes the passer; the first receiver becomes the defensive back; and the first defensive back moves on to the next group. Make sure players get chances at all three positions. 9 Michigan Youth Flag Football Drill #7: Passing & Receiving Purpose: To develop running, passing, and receiving skills. Organization: Set out a 20 x 20-yard area and divide the team into even groups. Set cones 5 yards from each end line and 10 yards apart. Each team requires one football so the entire class can participate. This is a relay race. The object is for QB 1 to pass to WR 1, who has run to cone (A)to catch the ball. The second participant in line is WR 2. WR 2 runs to cone (B) and repeats the drill. The drill is repeated until every participant has a turn. If the ball is dropped, the WR picks it up and continues with the drill. WR must stop and completely turn around giving the QB a big target. WR must give a solid handoff to the QB when returning to line. After each relay race, a WR becomes the new QB. 10 Michigan Youth Flag Football Drill #8: Passing & Receiving Purpose: For a WR to find an open area in order to catch a pass. Organization: Set out a 10 x 10-yard area. Divide the players into groups of six, five players on offense and a single player on defense. Station four players in the corners of the area and a lone receiver, shadowed by a defender inside the area. This can be duplicated to allow full participation for entire class. One football is needed per group. The object is for the QB's to pass the football around until an opportunity arises to throw the football to the WR. The length of the drill is 30 seconds. Six points are awarded for each reception and the defense is awarded three points for an interception. Either switch to a whole new group of players at QB, WR, and DB. Or, switch kids on the field into new positions or bring new kids into game. Progression: Lower drill time to (20) seconds in length. Add an additional DB to the field. If the football is intercepted, put the QB who threw the interception on defense. How WR and QB communicate. Defenders should focus on WR hips not shoulders. 11 Michigan Youth Flag Football Drill #9: Passing & Receiving Purpose: To develop proper pass patterns and defensive skills. Organization: Set out a 20 x 20-yard area and place two sets of cones on either end of the drill, 5 yards off the end line. Divide into two equal teams. One half of each team starts on offense, the other half starts on defense. Each team has a football. Use the entire class in one drill. The WR snaps the football to the QB and the WR runs a 5-yard "out" pattern. The cones are set out to indicate direction. When the ball is snapped, the DB runs to the area where the WR will try to catch the football. If a catch is made, the WR must then try to run past the DB and score without having his/her flag pulled. The WR then goes to the end of the DB line and the DB goes to end of the offensive line on their own team. The WR will give the football to the DB after the drill. The DB will hand the football to the QB in the DB's new line. 6 points are awarded for each TD. The coach keeps score. QB passes to where the WR will be at end of his/her pattern. WR looks back for football when he makes the turn to the second cone. DB watches WR's hips for any fakes, not the shoulders or head. 12 Michigan Youth Flag Football Drill #10: Passing & Receiving Purpose: To develop proper receiving and passing skills. Teach participants how to spread out and use the entire field. Organization: Set out a 40 x 40-yard area. Divide teams into even groups and place players opposite each other across the field. The entire class can participate. Eight to ten participants start on the field, the remaining players stand on the sidelines. This game concept and playing area is similar to basketball, but without the baskets or dribbling. The ball starts with one player at the center of the field. The object is to throw the football to a teammate in the circle or goal. The player with the ball has to pass to his/her teammates inside the game or can get assistance from teammates on the sidelines. The player with the ball can only take two steps, similar to basketball. The players in the playing area without the ball are free to move around. The ball must be passed within 10 seconds or the other team gets possession of the ball. The idea is to try to knock down or intercept a pass. If the ball is dropped or intercepted, the team on defense is awarded possession of the football. 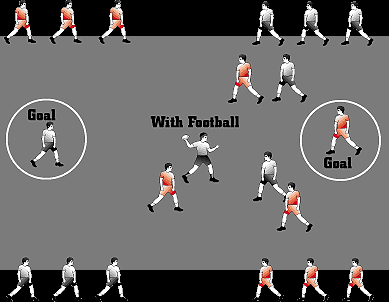 6 points are awarded each time the ball is passed to a player in the goal area. The player in the goal cannot leave that area. Stress the importance of spreading out and being in position to receive a pass from a teammate. In a game situation, the offense has an advantage when there is more room to move. 13 Michigan Youth Flag Football Drill #11: Pass Pattern Combinations Streak Out: #1 WR runs a 5-yard out toward the sideline and WR #2 runs a streak. Streak Curl: #1 WR runs a streak and #2 WR runs a 5 yard-curl inside. Post Out: WR #1 runs a post and WR #2 runs a 5-yard out. Corner Smash: WR #1 runs a corner and WR #2 runs a 5-yard smash. Curl Post Corner: WR #1 runs a 5-yard curl and WR #2 runs a post. Twin Curl: WR #1 and WR #2 both run 5- yard curls. This play is used in short-yardage situations. *On all these patterns, #1 is an option if #2 is covered, and vice versa. 14 Michigan Youth Flag Football Drill #12: Tossing The Ball Purpose: To develop proper tosses or pitches. Organization: Set out a 20 x 20-yard area. Divide teams into even groups and place players opposite each other across the line about 5 yards apart. Players on Team A are the quarterbacks. The players on the B team are running backs. They will switch positions after each turn. Footballs for each pair are recommended and the entire class can participate if space permits. The QBs will have their backs to the RBs. The first several practices, the instructor will call the cadence, "SET GO." The instructor will then choose a QB to call out the cadence. Each QB holds the football in front of them with their knees bent and their feet apart. On the QB's "SET GO" the RB moves to the right to take the pitch from the QB at a distance of 3-5 yards. The first time through the drill, have players move in slow motion to get the feel of the drill. Switch positions; the QBs are now RBs and vice versa. The players now run half speed through the drill to the left. The players switch positions again and run through the drill at full speed. The QB will look at the stomach area of the RB when making the pitch it to that area. The toss or pitch is similar to passing in Rugby. 15 Michigan Youth Flag Football Drill #13: Running The Ball Purpose: To develop running skills. Organization: Set out a 20 x 20-yard area. Cones are set 8 yards apart to simulate a mini-end zone. One ball per team. The entire class can participate. If cones are limited, use t-shirts, shoes, or tape on the floor as markers. This is a relay race between teams. The first participant in each line has a football and will run with the football around each cone and then come back to the beginning of his/her line. When the participant returns to the line, they will hand off to the next participant at the front of the line, then go to the back of the team's line. The race is won by the first team to have each participant complete the race. Progression: Have players backpedal or hop over the cones. Player switches arms carrying the football, with the football always carried in the arm nearest the sideline. Players cut on their outside foot, not crossing their legs over when they go around a cone. 16 Michigan Youth Flag Football Drill #14: Running The Ball Purpose: To develop running skills and avoid having the flag pulled. Organization: Set out a 40 x 40-yard area. Place cones 8 yards apart to simulate a mini-end zone; one ball per team. The entire class can participate in one drill, or duplicate the cone set-up if space permits. Relay race between teams. Drill is completed when all RBs have run through the mini end zone once. There are 3 mini-end zones for the RB to run through. Offensive team has to play against the other team's defense. RB has to run through three mini-end zones and avoid the defenders in each. The DB attempts to pull the RB flag and stop him/her from scoring. DB's are awarded 3 points for each flag pulled. Points are counted after the race. The RB is awarded 6 points for each successful TD. The RB must run directly to the end of the line after handing off the football to a teammate on the other side of the drill. Offensive and defensive players are switched after each relay race is completed. If both RBs flags are removed before reaching the last DB, the RBs run back to the next RB in line and hands off the ball. RB plays with head up. DB watches the movement of RB's hips, not the head or shoulders. 17 Michigan Youth Flag Football Drill #15: Running The Ball Purpose: To develop running skills and avoid having the flag pulled. Organization: Set out a 40 x 40-yard area. Place cones 2 yards apart to simulate a mini-end zone. Recommended for six pairs of players, the maximum number of kids is 20. If cones are not available, marks on the ground or floor, t-shirts, or tape can be used. Balls are optional. Pair players up - one as a RB and one as a DB. The DB is in back of the RB and chasing the RB from behind. RB's should carry a football (if available). Each RB starts off on the end line at either side of the playing area. The DBs start 5 yards behind the RBs. On the coach's whistle, the RBs attempt to cross through the mini-end zones without getting their flags pulled by the pursuing DBs. The DB must chase the RB. Both flags are pulled, RB is out. If one flag pulled, the RB keeps going. Any end zone can be crossed and there is no order in which the end zones have to be crossed. The drill lasts 45 seconds and then you switch RB's to DB and DB's to RB. Progression: Shorten time to 30 seconds. RBs run plays with their heads up. DB watches the movement of RB's hips, not his/her head or shoulders. 20 Purpose: To develop the defensive skills of pulling the flag and following a WR. Organization: Set out a 20 x 20-yard area. Pair up participants. The coach gives each team a name. The entire class can play, or duplicate drill if space permits. This is a mirror drill. Players must "mirror" and stay with the player lined up across from them. When the coach calls out a team name, that team becomes the offense and tries to score in the defensive team's end zone. A score is worth 6 points. If a player has his/her flag pulled they are out for that one drill. Defensive players can go after other offensive players if they have pulled the flag of their partner. Offensive players have 45 seconds to score. Each score is worth 6 points. Progression: Coach will lower the time limit to 30 seconds. Coach keeps track of offensive player scores and subtracts 3 points for players who had their flags pulled. DB practices staying in front of offensive player. 21 Michigan Youth Flag Football Drill #19: Defense Purpose: To develop defensive skills of backpedaling and pulling the flag. Organization: Set out a 20 x 20-yard area. Pair up participants or as many as space allows. Pair up kids - one group is WRs, the other DBs. Each DB will backpedal and "mirror" the WR. All players will start in slow motion on the instructor's command. Switch, making WRs play as DBs. Progress to half speed. Switch positions again. Now go to full speed. On the instructor's whistle, the WRs will try to run past the DBs, who are backpedaling. During the drill, the instructor calls out "GO", the DB is now allowed to pull the flag of the WR who is still running for the end zone. The "GO" simulates the WR catching the football. Progression: The coach will pass a football to an open offensive player when "GO" is called. DB stays in front of offensive player. DB watches WR's waist and hips. 22 Michigan Youth Flag Football Drill #20: NFL Ultimate Purpose: To develop an awareness and feel for the flag football concept. Organization: Set out a 20 x 40-yard area. Pair up 10 participants. Rotate players, or duplicate the drill if space permits. The concept is for the team with the football to pass the ball to teammates without dropping the ball, all the while moving the ball toward the end zone. The player with the football has 10 seconds to pass or pitch the ball to a teammate. The ball can be passed or pitched forward, sideways, or backwards. The player with the ball can only take 2 steps after catching the ball. The offensive players without the ball can move anywhere on the field. The ball always has to be passed toward the end zone - 6 points are awarded for a touchdown. After a touchdown, the team that was on defense switches to offense and takes possession of the ball on their own 5 yard line. If the ball is dropped or intercepted, play continues with the other team in possession of the ball from the point of the turnover. Each defensive player must stay at arms length from the player with the ball. The defensive play is similar to that of basketball. WRs must work to get open and not bunch up. 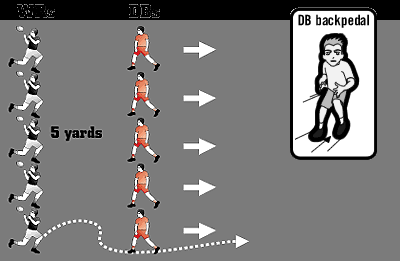 24 Michigan Youth Flag Football - Basic Routes: The Passing Tree The Passing Tree is a numbered system used for the passing routes. The passing tree system is designed so that all even-numbered routes (2,4,6,8) are run towards the middle of the field and all odd-numbered routes (1,3,5,7,9) are be run towards the sideline. These routes are used for all positions on the field. Since the ball is always placed in the middle of the field, the center faces the dilemma, and all of the center s routes should be based on the play design. Quick Out (1): This is a 5-8 yard route then the receiver cuts out towards the sideline then looks for the ball. Slant (2): Deep Out (3): Drag/In (4): Flag (5): Curl (6): Post Corner (7): Post (8): Fly (9): This is a 3-5 yard route forward then the receiver breaks towards the middle of the filed on a 45 degree angle and looks for the ball. This is a yard route. It should be run exactly like the quick out only deeper. This is a 5-8 yard route forward then the receiver breaks into the middle of the filed on a 90 degree angle and looks for the ball. This is a yard route forward then the receiver breaks at a 45 degree angle towards the sideline and looks for the ball. This is a 5-8 yard route forward then the receiver stops and turns to the ball. This is a yard route forward then the receiver cuts on a 45 degree angle to the middle of the field for a few steps then the receiver cuts on a 45 degree angle towards the sideline and then looks for the ball. This is a yard route forward then the receiver breaks on a 45 degree angle towards the middle of the field and looks for the ball. This route is run straight up the field with the receiver looking for the ball after he gets past about 15 yards. 25 Michigan Youth Flag Football - Basic Routes: Running Back Routes While your backs may run any of the assigned routes on the primary passing tree, these routes have been designed as a high-percentage second option to complete a pass. These routes will not be numbered. You will always refer to them by name. Replace This is a 8-15 yard route where the running back angles forward on a 45 degree angle and then goes straight up the field and looks for the ball. Arrow This route the running back drives on a 45 degree angle towards the sideline and looks back for the ball. Stop Circle Out/In Look for open space. Turn to the quarterback with your back to the defender. This should be a pass to the chest. This route starts toward the sideline and then circles back to in front of the QB. This route starts straight up the field then the running back breaks "out" or "in" depending on the play. 26 Michigan Youth Flag Football - Basic Formations: Play Calling & The Split T Now you've read your passing tree and understand the pass routes available, there are two options you have in play calling. The simple option is to use positions attached to route names. The more advanced option is to use the passing tree numeric system. There will be a few constants when calling plays. 1. You will always call the formation first, including the alignment (left or right, if necessary). You ll call an alignment in an unbalanced formation (anything but a Split T) 2. You will always call your receiver pass routes from left to right (then your Halfback (H) route, followed by the Center route) We will work with the understanding that there are three basic formation calls: Split T, Twins and Trips. We will begin learning our formations by teaching the most basic formation, the Split T, where one receiver is on either side of the ball, split out approximately yards from the center, with a single running back set behind the quarterback. This is a balanced formation with no strongside, therefore we will not have a call side (no right or left). The formation when set looks like the letter "T. Split T Left Fly Right Fly H Flare Left Center Stop Design 3 plays from this formation. Teach these plays going to both the left and the right side. 27 Michigan Youth Flag Football - Basic Formations: The Twins Formation In our next series of plays we will run out of Twins, where two receivers are on either side of the ball, split out approximately 8-10 yards from the center, with or without a single running back set behind the quarterback. This gives a strong side to the call side of the formation. There is the option to have a single back or no backs. Based on the passing tree routes, and using our formula of calling your receiver routes from left to right followed by the running back route then the center route, the following play would be called: Twins Right Single Back Left Fly Right Fly H Flare Left Center Stop Design 3 plays from this formation. Teach these plays going to both the left and the right side. 28 Michigan Youth Flag Football - Basic Formations: The Trips Formation In our final series of plays we will run out of Trips, where three receivers are on either side of the ball, split out approximately 6-8 yards from the center, without running back. This once again, gives a strong side to the call side of the formation. If you want a more advanced system to call plays, you can use the actual numbers attached to the routes on the passing tree to call your receiver routes (refer to passing tree for routes and the numbers associated with them). You are still calling your receiver routes from left to right. Instead of designating the receiver and the route he/ she will run, you call out a sequence of numbers that tells the receiver which route to run. The key to using this numeric system is to ensure that each receiver knows their position. The first number is the left receiver The second number is the middle receiver The third number is the right receiver Trips Right 999 Center Arrow Instead of: Trips Right Left Fly Middle Fly Right Fly Center Arrow Design 3 plays from this formation. Teach these plays going to both the left and the right side.